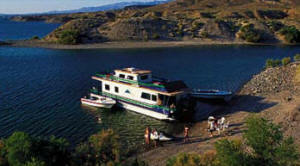 houseboat, boat, and waverunner rentals. The area around the Lake Mohave and along the Colorado River below Davis Dam also provides a lot of recreation areas for fishing, boating, swimming, water skiing, waverunners, camping, picnicking, exploring, auto touring, photography and "just relaxing." There are a lot of beaches that can only be accessed by boat. During the summer, boaters seek out beach sites for camping. They swim, water ski and relax. If you like to fish for Trout the clear waters at the upper end of the lake are excellent, while Largemouth and Striped Bass are taken from the lower end of the lake. Near the Dam is a good place for Stripers. A fishing license from either Arizona or Nevada, to which a special-use stamp from the opposite state is attached, is required for those wishing to fish on Lake Mead or Lake Mohave. Public areas are located at Katherine's Landing, in Arizona (near Davis Dam), and at Cottonwood Cove, east of Searchlight, Nevada. Boats and waverunners can be rented at Katherine's Landing. Public campgrounds are available at both locations providing tent and trailer camping, restaurants, lodging, docking facilities, boat and fishing tackle equipment, and fishing licenses. Willow Beach, 31 miles upstream on the Arizona shore, has gas for boats and is being updated because it is in a flood zone. Check with Rangers for the latest update. Entrance fees are for entrance into Lake Mead National Recreation Area. Entrance stations are under construction and are expected to be open in May 2000. Current locations are East Lake Mead Drive, East Lake Mead Blvd., Boulder Beach and Katherine Landing. Additional locations will be added in future projects. Holders of annual passes will be authorized to enter the park through the far right hand lane of the entrance station. Free - medically determined to be permanently disabled. All motorized vessels entering the park will be assessed a lake use fee charge. This includes vessels that are in dry storage and/or maintained in slips at the marinas. Remember these are average temps. We have seen days in July/August that have reach 128 degrees. We have experienced morning lows of 105 degrees. Those of us that live in Laughlin greatly thank whoever invented air-conditioning. Seven Crown Resorts, at Katherine Landing has houseboat, boat, and waverunner rentals. Personal Watercraft Issue What's up with waverunners and Jet Skis on Lake Mohave and Lake Mead? Are they banned?